I strongly recommend that you run both versions and do a side-by-side comparison of the behaviour while working through the sections below, then hopefully the changes described will make sense more easily. 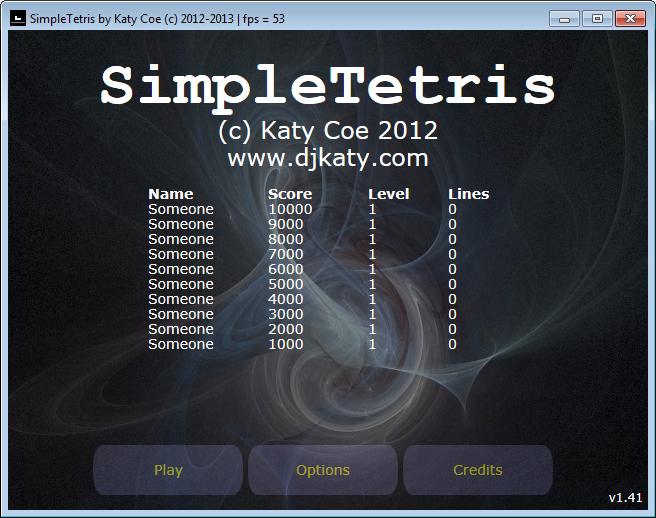 to run SimpleTetris 1.31 you need the Visual C++ 2010 Redistributable Package installed (SimpleTetris 1.41 does not require this). 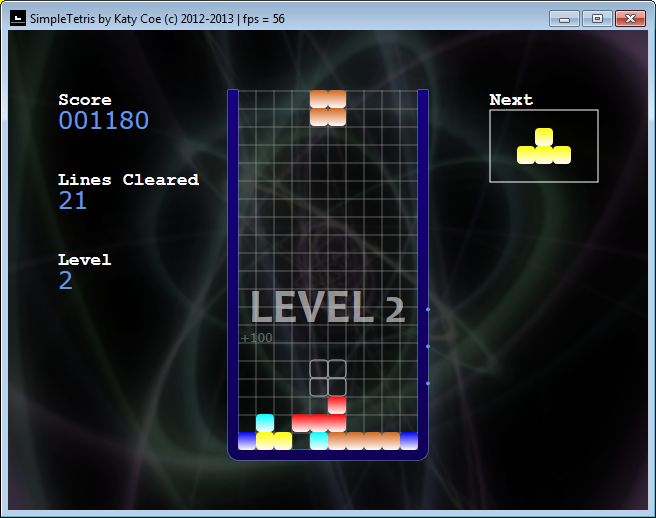 to run SimpleTetris 1.41 you need Windows 7 SP1 with Platform Update for Windows 7 or Windows 8 (SimpleTetris 1.31 does not require this and will also run on Windows Vista SP2 with Platform Update). As it stands now, the tracer dots which move around the bucket keep going when the game is paused, as does the bucket fill colour animation. Your game may also contain other fixed time-based animations like this. To pause everything when the game is paused, each sub-system in your game must be notified whenever the user pauses or unpauses so it can take the appropriate action (you can think of this as firing or dispatching a pause or unpause event). Notice that the Playing state can be entered both from the main menu and from the pause state, so we only want to unpause the bucket animations when the player unpauses the game (not when the game starts), hence the check of the previous game state. If you have other sub-systems which also need to be paused and unpaused, these can be slotted into the case statements above, and we will see further examples of this below. We are going to use FMOD for this, and specifically our library SimpleFMOD which is a wrapper around the official FMOD API that makes things somewhat simpler. in the Command Line box, type: copy /y "$(ProjectDir)assets\fmodex.dll "$(TargetDir)"
In my SimpleTetris solution, I have all the game assets in a folder called assets in the main project folder, including the DLL supplied with FMOD. Change the path in the command line above as needed. Note that the trailing backslash is not needed if you are using $(ProjectDir) to reference your project folder. This ensures that if any songs are fading in or out, that their volumes are updated correctly. In SimpleFMOD, music is stored in Song objects and effects are stored in SoundEffect objects. The SimpleFMOD object is used to do all interactions with the FMOD sound system. Let’s start with the two simplest possible examples: music for the main menu, and a sound effect that plays whenever you move a piece. 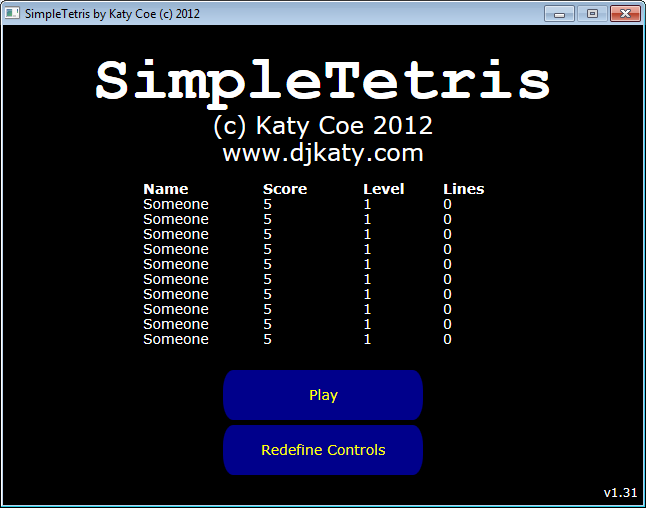 The identifiers used above to reference the resources are defined in resource.h and SimpleTetris.rc. You can change the names of the identifiers in Visual Studio’s Resource Explorer but you should never edit these two files directly as Visual Studio does it for you. See Cutting Your Teeth on FMOD Part 3: Embedded Sounds In Your Application as Resources for more details. If you don’t care about storing the audio as embedded resources, you can just load sound files directly as shown in the first code snippet above. When a game ends we might end up in either the EnterName or MainMenu states depending on whether the player set a new high score or not. If the player gets a new high score, the state will change from EnterName to MainMenu after the player enters his or her name, but the menu music will already be playing, and we don’t want to reset it to the start of the song, so we check for this condition in the code above before deciding whether to re-start the menu music when the MainMenu state is entered. The code essentially remains unchanged from the previous version except for the insertion of moveEffect.Play(); wherever we want the sound effect to be triggered. From time to time we may want to play a sound effect based on the result of a condition that isn’t currently accessible to the sound code in our application. This is the case with the “line fill” sound effect (lineEffect in the code), which is a sound intended to be played as soon as a piece lands which results in one or more completed lines. 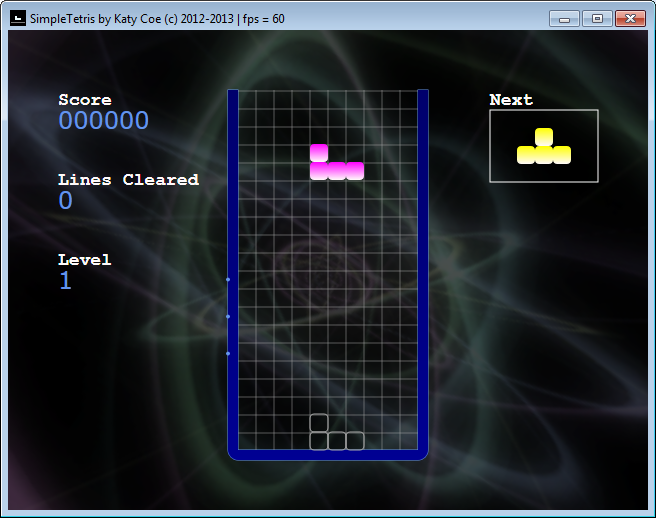 The latest version of SimpleTetris defines a slew of other sound effects for events such as a piece landing, leveling up, getting a score combo and the game over state. All of these are implemented in the same way as the examples above, so just search the source code for “.Play()” to find where and how they are hooked into the game code. If your game has discrete levels (such as a platform game), selecting a music track based on the current level is easy: you just store a reference to the track in the level definition and use it as required as the “current” track. In Tetris and some other games, the idea of a level is a bit more blurred. 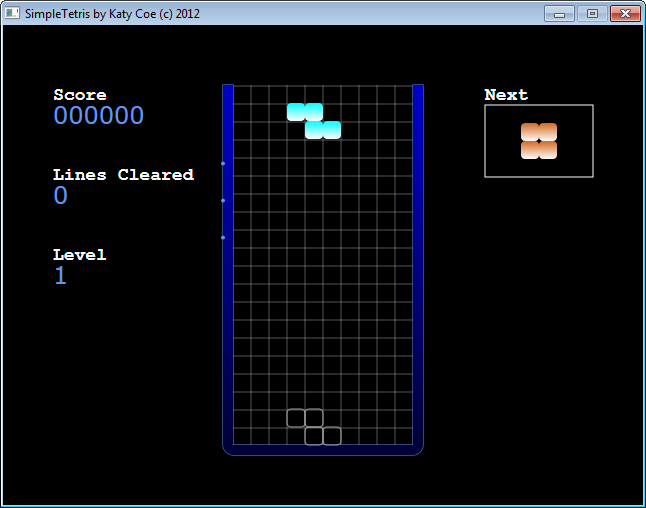 In Tetris, the level is nothing more than a number based on how many lines the player has cleared so far, which is used to determine how fast the pieces to drop. Movement through the levels is therefore fluid in that no transition or loading of new data is required. All the levels are essentially the same and the game world is not reset when the level increases. Note there are 3 tracks in total, indexed from 0-2. Essentially, this code checks if the current piece has just landed, and adds it to the bucket if so. The bucket is updated and the call to UpdateBucket() returns true if a new piece is needed, updating the player’s score, level and total lines cleared. It is here, therefore, that the level can change, and where we need to check if the currently playing track should be changed. We compare the player’s level from before and after the bucket is updated to see if we have leveled up. If so, we calculate the index of the track that would be playing (from 0-2) on the previous level and the new level. If there is no change, then no action needs to be taken. However, if the track indexes are different, we fade out the track that was playing on the previous level, and simultaneously fade in the track for the new level. This concludes the code on sound effects and music. The game now has menu music which starts and stops appropriately, in-game music which changes between levels, and sound effects that trigger on various in-game events! Figure 1. Level Up text animating automatically in an overlay scene. The text drifts upwards and fades in and out over 3 seconds. As with many graphics engine middleware products, Simple2D allows you to layer objects onto so-called scenes, which are rendered on-screen along with the rest of the application’s graphics output. All of the animations we created in the previous instalment of this series relied on classes to manage the animation which were created and destroyed as needed. For throw-away or incidental animations, where we just want to fire-and-forget, there is an easier way. Consider the case of leveling up. It would be nice to flash up a message on the screen when the level increases, and we would like to animate this so it fades in and out and drifts upwards, but we don’t care to manage the per-frame details ourselves, we just want to set the starting animation parameters, set the animation in motion, and let it be automatically destroyed when it is finished. 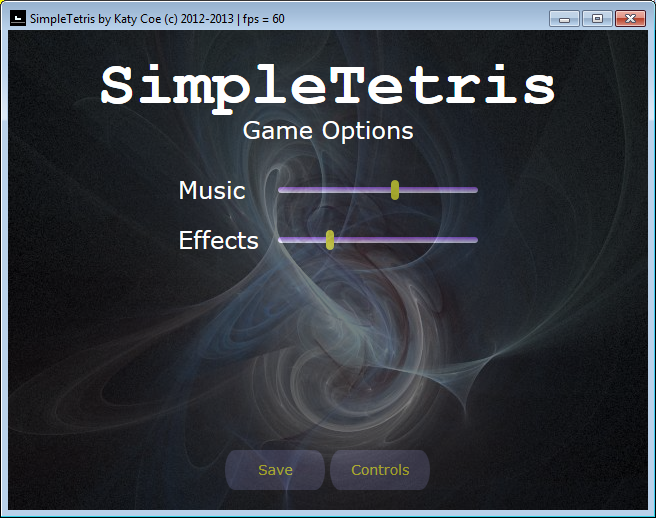 The call to Simple2D::SetRenderSceneAfter() tells Simple2D to render the game graphics generated in SimpleTetris::DrawScene() first, then the overlay scene afterwards. an animation for the alpha channel (transparency) of the text. Where 0 is fully transparent and 1 is fully opaque, the text fades in for 1.5 seconds then fades out for 1.5 seconds. an animation for the Y position of the text, which moves from 300 to 100 (upwards) over the course of 3 seconds. By setting the optional 3rd parameter of Bind() to true when we add the alpha channel animation, the animation as set as the master animation for the object. When the master animation completes (after 3 seconds in this case), the object it is bound to (the text label) is destroyed automatically and removed from the scene. In this way, the object is memory-managed for us and we don’t have to think about it. So far all the graphics in our game have been generated by the game code itself as simple lines, rectangles or geometry objects. Of course, we will often want to use sprites. Tetris doesn’t really need any sprites for its main gameplay graphics (which is one reason it was a good example project for the 8-hour coding challenge! ), but we can spruce things up with some backgrounds. Simple2D stores sprites as Image objects, and the underlying WIC (Windows Imaging Component) architecture it uses to load image data from files will automatically convert any supported image file type (eg. PNG, JPG, GIF, BMP etc.) into a Direct2D-compatible in-memory format. I recommend you use PNG files wherever possible for two compelling reasons: 1. they support transparency (variable alpha channel) in a straightforward way, and 2. they do not have proprietary license usage restrictions like for example GIF files do. Once again we are using embedded resources. If you want to load a file directly you can just call MakeImage(“filename”) instead. The first two arguments to Draw() are the top-left x/y co-ordinates to plot the image at. (0, 0) is the top-left corner of the screen. The third argument is the opacity (alpha) of the image. By setting it to 0.5 instead of 1.0, the background is dimmed somewhat so that it does not diminish the visibility of the interface buttons or high-score table. If you try changing this to 1.0, you will see that the result looks rather ‘cluttered’. Note that, of course, the background must be rendered before the rest of the objects to be displayed, otherwise they will be occluded by the background image, so this code comes before any of the other rendering code for the menus in DrawScene(). Figure 3b. The main game screen after a background is added. The background rotates at a linear speed in a continuous loop, and fades to a different background when the level changes. The idea behind a background which fades as the level changes is essentially identical to that of music with fades on level changes, except that we have to handle the fade ourselves. We also make the background rotate using a simple animation function and a bit of maths. The first animation function will return a floating point value from 0-360 (degrees of rotation) which repeats every 60 seconds. The second animation is only used when fading between two backgrounds, and returns a value from 0.0-0.8 (the alpha channel of the background to fade in), over the course of 4 seconds. Why use 0.8 instead of 1.0 for the maximum alpha value? For the same reason we used 0.5 on the menu background: so that the main game display is not overwhelmed by any vivid colours in the background. We also define a boolean value fadeAnimate to indicate whether a background fade is currently in progress. we are currently transitioning between two backgrounds (fadeAnimate == true), in which case we plot both the current background and the background of the previous level. The alpha channel value of the current background is rising as it fades in (from 0.0 to 0.8), and is the result of the output of fadeAnimation (which is reset when the level counter increments). The alpha channel of the background being faded out is 0.8 – bgAlpha, in other words the inverse, as its alpha channel decreases from 0.8 to 0.0 at the same time. To achieve rotation, we simply pass into the drawing function the output of backgroundAnimation which runs continuously on the 0-360 degree cycle per 60 seconds, then resets to 0 again. Since rotating the background at its normal size would result in some areas of the screen not being painted, we scale the background size up by a factor of 50% (multiply by 1.5), and offset the top-left corner by negative half of the screen resolution so that the centre point of the background is still the centre point of the screen at all times. The drawing function applies the rotation to the top-left co-ordinate of the image, so we don’t have to care about taking the rotation angle into account when we specify the co-ordinate. Astute readers will note that the fade occurs on every level change, not just the ones where the actual background images is changed. However, fading from one background to the same background using the technique described will have no visible effect, due to the way the alpha channel values are combined when rendering takes place. So, we ultimately get the result we want. That wraps up background animations! Most games have options which are stateful (meaning, their values are preserved when the game application exits and are re-loaded next time it starts up). In this example, we look at how to set the overall volume of the music and sound effects. SimpleFMOD deals with the actual volume processing details for us by separating music and effect playback into distinct channel groups (see Cutting Your Teeth on FMOD Part 2: Channel Groups for the gory details), so we only need to concern ourselves with how to actually store and set the values here. This can simply be done using regular member variables or a class of public properties to store and retrieve the game options. Here we use the very simple implementation of two integers storing values from 0-100 for the music and effects, called volumeMusic and volumeEffects respectively. These are defined in the main game class, their values loaded from a file when the game application starts, and saved whenever the user modifies them via the options interface (see below). We could use a game options class and boost::serialization to handle this as we did with the high score table, and for games with many options, this is a smart choice. We use this technique extensively in 2D Platform Games Part 9: Storing Levels In Files and 2D Platform Games Part 10: Improved Level Management and Storage to store entire levels with a complex structure, so check those articles for more details on using Boost for the job. Important to note is that the load function checks if the file exists, and if not, sets default values for the options (full volume in this case) and creates the options file. The volume setters in SimpleFMOD accept values from 0.0-1.0, and we are storing volumes as values from 0-100, so we scale them down appropriately before passing them to the volume setter functions. We update the appropriate volume variable by fetching the slider’s value with GetValue(), and update the actual master volumes immediately by calling SimpleFMOD’s volume setter functions as appropriate. What professional game would be complete without an intro sequence? This is a sequence of animations which runs once when your game starts to introduce the game. It often includes a company logo, trademark logos of licensed products you used in the game’s development and so forth, as well as copyright and online play notices. The code for an intro sequence is entirely game-dependent, so the example presented below is purely for illustration purposes; however, it should provide an excellent basis to describe how to create any complex chain of timed animations, regardless their intended use. To understand the code that follows, it is really beneficial to run the executable linked at the top of the article so you can see exactly what happens, as it is difficult to explain in words (and indeed, I don’t explain it at all below, I assume you have watched it several times to understand the flow of events). 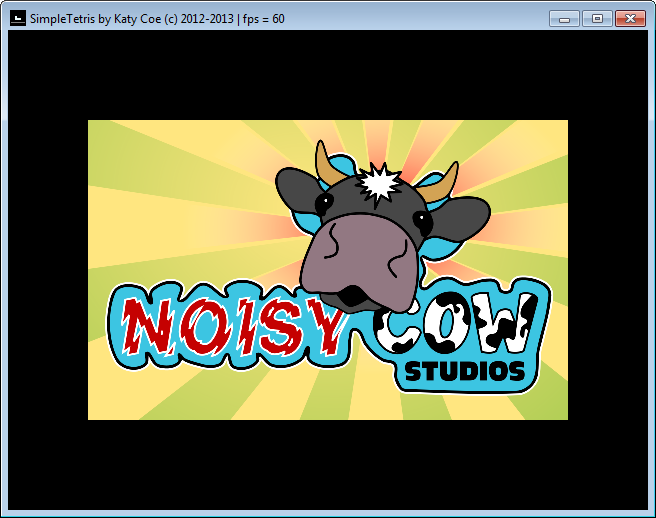 Note this is done after loading the volume options from file, so these options will also apply to the intro sequence. We will put all the work of generating the intro sequence into generateIntroSequence() below. To reduce the complexity, we will split these first three stages into three separate Simple2D Scenes. The scene, scene object and animation object classes in Simple2D provide many callback hooks – including time-based hooks – and these will prove invaluable to keeping the code as simple as possible. Remember that scenes provide the ability to create fire-and-forget animations which trigger at specific time offsets, so without this, we would have to figure out how to render the animations ourselves, frame by frame, retaining and updating all of the positional and alpha channel data ourselves by hand. Instead, our approach here will be to simply specify when everything should happen and what the animation paths/functions should be, trigger the start of the sequence and then ignore it until it finishes. With a complex animation sequence such as this, this is hugely simpler than managing everything on a frame-by-frame basis. Although the studio logo is stored as a single sprite, we are going to use Simple2D’s sprite sheet capabilities to cut the logo into pieces in-memory. This saves us from storing loads of rectangles with bits of the logo in separately. Since the logo is stored at 1920×1200, we scale it down by a factor of 4 in each direction (for a total scaling down of 16) when we set xW and yH. The calculation of xL and yL ensures the logo is positioned in the centre of the screen. Note that when we talk about the source rectangle, we are referring to the pixels in the logo image itself. The size on which it is rendered on the screen (the target rectangle) is different. We next need to create a map of falling pieces and their timings. We make a temporary struct for this, where each element describes the tiles to use and the fall time and fall speed for one Tetris piece. A Tetris piece always consists of 4 squares (tiles), so we store the x and y tile co-ordinates for four tiles in each element. The fallDelay variable specifies how many milliseconds to wait since the previous piece started falling before starting to make the piece being described fall. The fallTime variable specifies how many milliseconds it will take the piece to fall, allowing us to create the effect where the pieces fall gradually faster and faster as the sequence progresses by reducing the fall time of each successive piece. It also allows us to make the chained piece (which I will call the awkward piece below) to fall very slowly. The tiles are indexed from 0-9 horizontally and 0-5 vertically, where (0,0) is the top-left tile and (9,5) is the bottom-right tile. Each Tetris piece has four tiles as mentioned above, so we create an animation for each tile, for each Tetris piece. 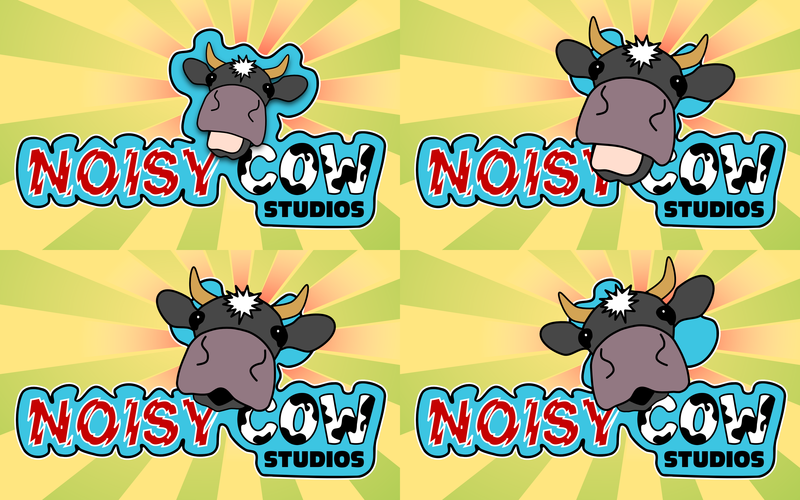 The logo is actually stored as a sprite sheet of 3840×2400 for the cow movement (see Figure 6 and code below) so we only need the top-left quarter of it here. We get this by shearing it when we load it as a sprite sheet into four quarters and setting the frame of animation to zero so that only the top-left quarter is used. This is done in the SpriteSheet constructor call by specifying 2 tiles in x and 2 tiles in y, and an initial frame of 0. SetRectWH specifies the rectangular area on the screen where the tile will be rendered. We set its X position, width and height, but leave Y at 0 as we will animate this value later. SetSourceRectWH specifies the rectangular area in the current frame of the sprite sheet that will be used as the tile to render. We simply multiply the tile X and Y indices by the width and height of a tile in the source rectangle to obtain the source tile co-ordinates. We then create the vertical animation. We keep a cumulative count of how much time will have elapsed so far in timeDelay. The first animation in the chain keeps the tile off the top of the screen until it is time for it to start falling. The second animation makes the tile fall vertically (increases its Y co-ordinate) from 400 pixels above its finishing point (which is just off the top of the screen) to its finishing point (the final target rectangle of the tile), in fallTime milliseconds, using the first quarter of a sine wave in reverse as the speed (which essentially means the piece accelerates continuously as it falls, rather than falling at a linear speed). Finally, we bind the created animation chain to the Y co-ordinate of the tile and add it to the scene. The source rectangle remains the same, of course. This changes the fall behaviour of only the awkward piece, such that it falls linearly from 250 pixels above its finishing point (which is just off-screen) to its vertical finishing point. Since we set fallTime for this piece to 4 seconds in the struct definition, it falls very slowly. Since it will be hanging from a chain which slowly moves down, this is what we want. Here we first wait for the tile to be in its final Y position, which happens at totalDelay + pieces[p].fallTime milliseconds into the total intro sequence, then we shift it left from its offset X position to its final position over the course of 4.5 seconds. The chain is stored as a 165×1925 sprite, so we scale it to 5% size. chainXTweak is added to the chain’s offset from the tile’s X position so that it appears to be holding the centre of the tile rather than the left-hand side. First note that this code runs four times because it repeats for each tile in the Tetris piece, but we only want one chain, so we use the somewhat messy if (i == 0) test to only run the code when the first tile is being processed. It doesn’t matter which tile we use, as long as we only add one chain. After loading the chain sprite, we set its source rectangle to use the whole sprite, and the target rectangle to be positioned centered horizontally with the tile that we want it to appear to be attached to. The Y position of the target rectangle is not set yet. Wait at some irrelevant off-screen location until the awkward piece is about to fall. We create the chain only when processing the awkward piece so totalDelay will be set nicely to precisely this time offset already. Move the chain down the same number of pixels (250) and at the same rate (pieces[p].fallTime) as the awkward piece. The subtraction of chainH * chainScale ensures the the bottom of the chain exactly touches the top of the awkward piece tiles. Whisk the chain away upwards 250 pixels over the course of 1.5 seconds. 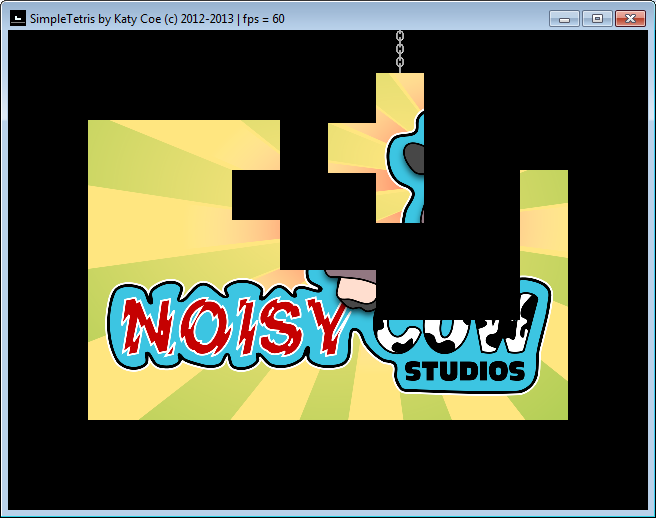 The rest of the pieces continue falling while this happens because its animation time is not added to totalDelay. We can ensure sound effects run when they are supposed to by attaching triggers to play them to the animation event handlers. This is done by calling Animation::SetStartEventHandler or Animation::SetDoneEventHandler depending on whether you want the animation to play when the animation starts or ends. Note that this code plays another crucial role: when the final piece has finished falling, we move onto the second stage of the intro sequence – the cow head animation – by calling SetScene(intro2);. We first load the sprite sheet and set the target rectangle to the same centerized screen position we used for the falling pieces animation. The method SpriteSheet::SetAnimation() expects a function which returns a decimal value from 0-1, indicating the position through the series of animation frames. The value is scaled up to calculate the current frame. Since we are using 4 frames here, we use the values 0, 0.25, 0.5 and 0.75 above to indicate frames 1, 2, 3 and 4 respectively. display frames 3 and 4 alternately for 2.4 seconds (this is the cow’s head looking left and right, see the bottom two images in Figure 6), with each frame being displayed for 0.05 seconds at a time (the animation in the loop stays within 0.5-0.74 for 0.05 seconds then 0.75-0.99 for 0.05 seconds for the total animation time of 0.1 seconds), repeating 24 times. The fade out therefore begins 4.5 seconds into the animation, which is 1.2 seconds into step 5 of the cow animation above – ie. 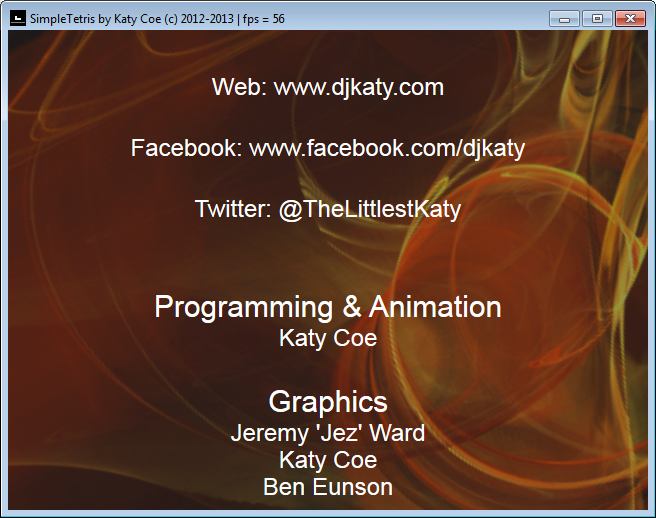 after the visible animation is finished and the standard studio logo has been displayed still for 1.2 seconds. The final step in the code triggers the 3rd part of the intro sequence to begin (the trademark logo screen) after the fade out has completed. Note that when the fade is completed, the game state is set to the main menu, which will – from the boiler plate code at the start of this section – turn the intro sequence off. Note the event handlers must be set for all three intro scenes. Note this resets all the animations to their starting points. We did not create the animations above in the pause-on-create state, so their counters start running immediately. This call resets them, however, so there is no problem. Similarly, when the scene is changed to intro2 and intro3 later, their animations are also reset when the scene is activated. Oh, you wanted game credits too? The supplied source code also shows how to make an animated credits sequence with a rotating background where the credits scroll up the screen like the credits of a movie (see Figure 7). I’m not going to explain this here but it is fairly simple – see the source code for the details. We’ve covered quite the range of topics here! I hope you can use the information within to add a bit of polish to your game project too. Please leave feedback below! Next time, we’ll show how to add network leaderboards to the game. Start configuring your web servers!